AUGH! I'm practically hyperventilating from the awesomeness. Take a second to let it all sink in. 1. It's a balloon animal TARDIS. Imagine how frakking long that took to make. 2. 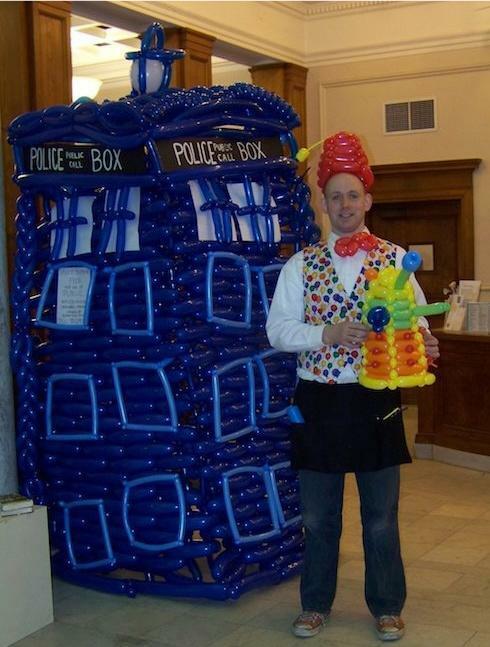 The balloon artist is holding a baby Balloon Dalek. 3. The balloon artist is wearing a Balloon Bow-Tie. As you'll remember, bow-ties are cool. 4. The balloon artist is also wearing a Balloon Fez. PEOPLE, THAT'S A FEZ! It's larger on the inside.